Were you not able to attend Political Prisoners in Contemporary Spain or would you like to rewatch the programme? Click here for the recording. In February this year the artwork Contemporary Spanish Political Prisoners by the famous and controversial Spanish artist Santiago Sierra was removed from a prestigious international art fair. 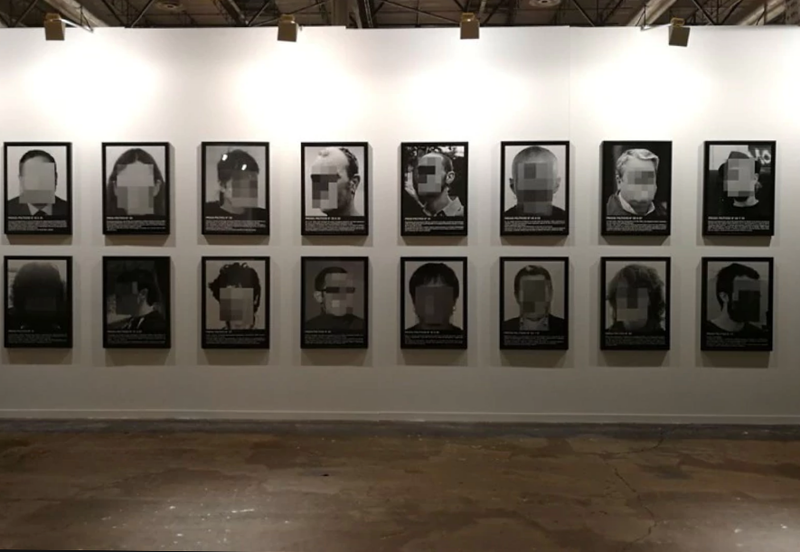 According to the art fair, which is being governed by the local government of Madrid, ‘the artwork undermines the “visibility” of other works at the fair.’ The work, a series of obscured portraits of ‘political prisoners’, includes faces of Catalan politicians who are accused of ‘rebellion’ for leading the Catalan separatist movement to break away from Spain, and are currently jailed awaiting their trial or living in exile. On May 31st, during the Forum on European Culture, we will engage in conversation with Spanish artists who have experienced the censorship themselves and with activists who fight for freedom of expression in Spain. What do they think about the state of the Spanish democracy? It is not the first time that people who publicly express their opinion in Spain are being silenced. Recently a Twitter user, a poet, some musicians and puppeteers have all been accused for inciting terrorism. How serious is this threat of censorship in Spain? And how should Europe react to these developments in Spain? Has the crisis of Spain become a European crisis? Political Prisoners in Contemporary Spain (2018) is a series of pixelated photos of 24 Spanish people who are portrayed as ‘political prisoners’. During the Forum Sierra’s photos are exhibited as posters in the streets of Amsterdam. Santiago Sierra is a famous Spanish artist, whose works often caused controversy. Whether casting sculptures from human excrement or paying junkie prostitutes to have a line tattooed on their backs, Sierra is a provocateur whose art raises headlines. Txell Bonet is a journalist, radiomaker and partner of the jailed political activist Jordi Cuixart, a leader of the Catalan independence movement who has been taken into custody by the Spanish Court last year. Cesar Strawberry is a rapper, writer and composer. In 2017 he was sentenced by Spain’s Supreme court to one year in prison for posting tweets that ‘glorified terrorism and humiliated victims’. Begoña Lalana is a Spanish lawyer. As a lawyer she is part of the Red Juridica de Abogados, a cooperative of lawyers have worked on many cases of contemporary political prisoners in Spain. Pablo Mayoral is a member of La Comuna de Presxs del Franquismo, an association for the political repressed of the Franco regime to give direct testimony of the repression that characterized the last period of the Franco dictatorship.